Today is my last day at Lake Austin Spa Resort and I am desperate to stay another night. It really has been the retreat I needed… but more about that on Monday! Anywho, this is the other dress I picked up from J.Crew a couple weeks ago and I am totally head over heels. It’s the perfect blank canvas for any mix of accessories, dressed up or down, don’t you think? I wore this frock for dinner on 4th of July, and also on a date a couple weekends ago. It’s super versatile and classic, but the flounce sleeves give it a little something extra. Also, I’m sure you noticed the gorgeous gems around my neck – my good friend Grace (from Stripes & Sequins) collaborated with BaubleBar to design a collection and each piece is stunning! This necklace is a favorite and certainly makes a snazzy statement, but I’ve gotten even more use out of this ring. Such a pretty piece, right? 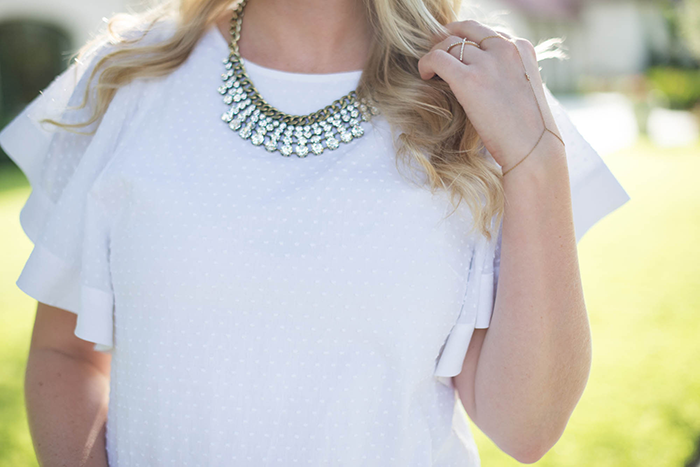 Simple and sleek and only $28! Click here to check out all her cool designs. Love that little dress, you look so cute. Beautiful summer dress and look! This dress is perfect, and the necklace is gorgeous. You look so pretty, girl! I love anything with ruffled details and this dress is stunning on you! Love the delicate swiss dot print of this dress and the sleeves make it so much more special. Can’t get enough of the white dress lately. What a beautiful summer dress Merritt! I love the perfect and fun sleeves. I have that same ring from bauble bar with stripes and sequins, such a perfect accessory! You are oh-so very right, that dress is the ultimate blank canvas! Love the way you spiced it up! That dress is adorable! I love the sleeves on it too! So now I need to go purchase this dress! 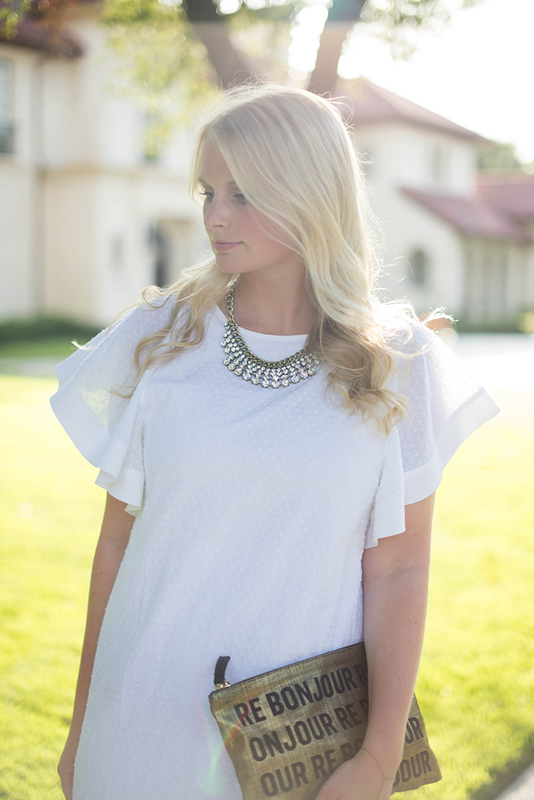 I love the girly ruffles and the necklace is the perfect addition! What a beautiful dress! You look stunning, as always. And those heels!! That dress is perfect for this yucky Texas heat!! Love this LWD on you. So summery and pretty! Love this so so so much – and I’m so happy you like the necklace! Such a pretty LWD. Love your effortless summer style! Nothing better than a crisp white dress right? Love this one – looks so pretty on you!!! I love your dress, the flutter sleeves and tiny dot details are so adorable! 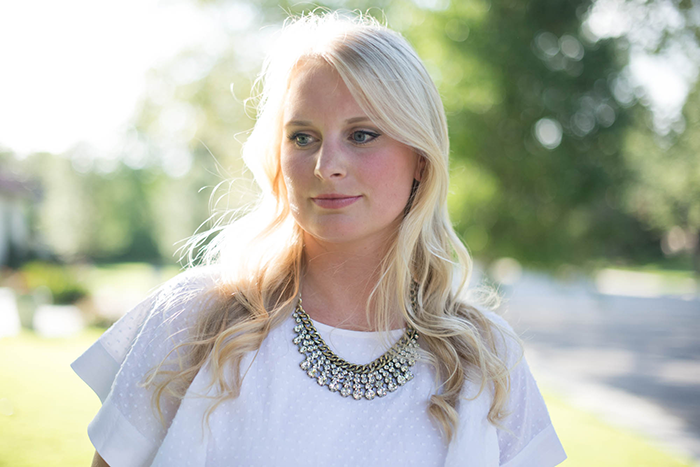 This dress is gorgeous and the perfect LWD! Grace’s collection is so pretty and I love this necklace. I can’t wait to hear about your trip! Love the details on the dress! That dress is seriously amazing. I love it. It is the PEFECT LWD!!! Sounds like you are having an amazing time. I want to go on a spa retreat too! I loved that collab! I really need one of the rings! I like the LWD. And the necklace is a hit too. I love a classic swiss dot! It’s something you don’t see too often but I love how timeless and feminine it is. 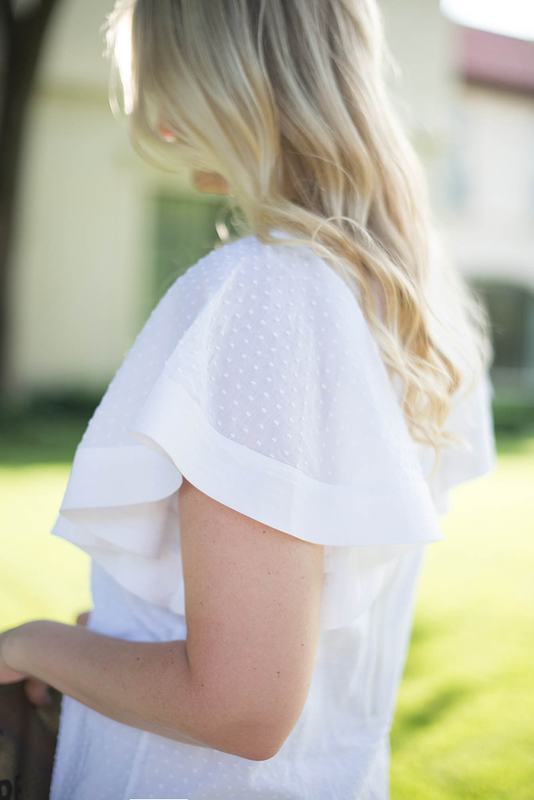 And the flutter sleeve is the perfect detail! Just lovely! What a great clutch!!! Such a statement piece, I love it!! I just bought this dress online! Was planning on pairing it with black cowboy boots for a charity gala with a Country Chic dress code. Thoughts? I haven’t seen it in person so I’m not sure it will work with boots. Hi, I have just found your blog, which is beautiful and we have something in common which is your fabulous Aquazzura amazon sandals, my absolute fav!, they look amazing with this gorgeous look. Such a pretty look! I love the ruffled sleeves!